Although there are more than 10,000 species of birds in the world, when an avian patient needs pain medication, veterinarians often rely on one drug, butorphanol. A type of opioid, the family of drugs that includes morphine and codeine, butorphanol deadens pain by working on the brain’s kappa opioid receptors, which pigeons possess in great quantities. However, “taking results from pigeons and saying that applies to [all birds] is like saying that you should dose a cow based on guinea pig data,” says Jana Mazor-Thomas, V13, who is researching pain management in red-tailed hawks while she pursues a master’s in comparative biomedical sciences and her D.V.M. at Tufts. 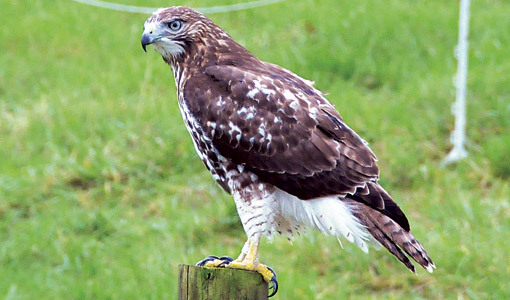 The predatory red-tailed hawks are frequently treated at the Tufts Wildlife Clinic for injuries ranging from gunshot wounds to broken legs and wings. Supported by grants from the National Institutes of Health and the National Wildlife Rehabilitators Association, Mazor-Thomas is studying hawk behavior, looking for one or more activities—head movements, foot shifts and beak clacks, for example—that might consistently signal pain. She also analyzed brain tissue from birds that were euthanized to identify the regions of the brain that control pain. The way the hawks move their heads may provide a basis for measuring pain in other avian patients, Mazor-Thomas says. “Birds [visually] track things a little bit differently than mammals do. Their eyes aren’t quite as mobile in the socket, so they tend to move their whole head,” she says. “You can count each of those head movements, and they seem to be very reliably altered by pain.” If head movement does indeed provide a way to assess pain, it would help avian veterinarians test different medications or dosages to achieve the best combination for relief.